A once in a lifetime encounter on a deserted beach occurred yesterday evening. 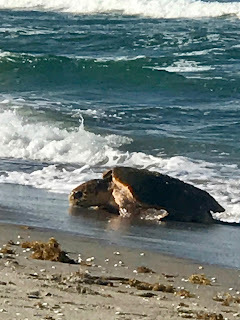 Chris and I along with Francis and Mary were at the Jupiter Island beach enjoying an end of the day happy hour when, about 25 yards from us, a loggerhead turtle crawled out of the surf and began to move up the beach to lay eggs. It was about 6PM in the evening and these things just do not happen at that time of day. I was in shock when I looked up the beach to the north and saw the turtle emerging from the sea. At first I thought it was a large piece of debris, but when I realized that it was a turtle, I let everyone in the group know. Loggerheads, and other turtles, typically come ashore under the cover of darkness to lay their eggs. An article by the Sea Turtle Conservancy describes routine behaviors. The turtle we saw last night was intent on digging a nest and laying eggs during broad daylight. 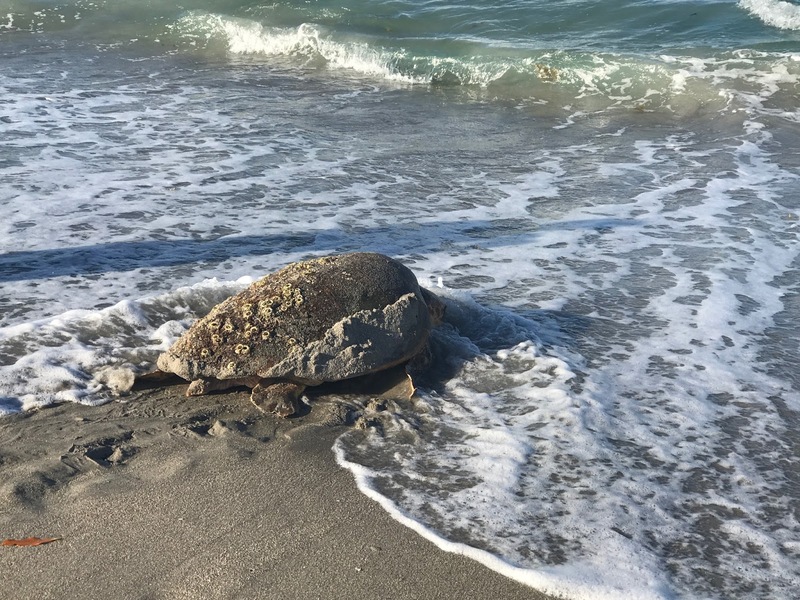 Fortunately the beach was deserted, except for the four of us who remained silent and with only very limited movement until the turtle had completed laying her eggs and began the trek back to the ocean. It was only at that point that we approached her to take some closer images, but we never touched her or obstructed her path to the sea. During her entire time on land in the sun I was concerned that the turtle would overheat. The movie above shows the event as best that I could record it. 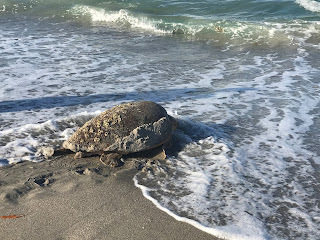 There is no video of the actual egg laying because we maintained a respectful distance from the turtle until she was finished. 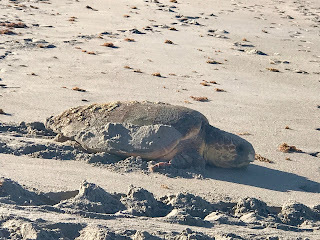 We have been on the beach at night and seen turtles come out of the surf and we have watched them lay eggs, but to experience the entire event from start to finish is something that just does not happen during daylight hours. The turtle last evening was intent on her mission. Three fishermen walked by at the surf line while she was laying, but the turtle was undeterred from her mission. Throughout the event, we were in awe of the scene being played out before us. We had been on the beach when nest eruptions occur during the daylight hours and many small loggerheads begin their race to the ocean, but to see a magnificent turtle emerge from the surf during daytime was a sight to behold and I am very happy that I was able to record it.